Were there waterways inside Lal Bagh once upon a time? How did the famous garden get the unique design? How did the famous glass house came to be in it? This chapter from a book on Bangalore’s early history — Bangalore – the early city – AD 1537-1799, authored by Yashaswini Sharma, an architect from Bengaluru, to be released on June 4, 2016, at the British Council, Bangalore, provides some insights. Exclusive images collected from archives make it an interesting read. The garden at Śrirangapaṭna used to house a garden palace called the Lāl Bāgh palace. It now houses Hyder and Tipu’s mausoleum. 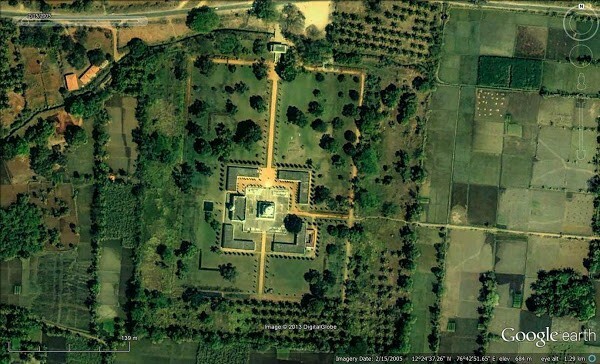 The Daria Daulat Palace in Śrirangapaṭna was constructed within a garden of about 46 acres (fig. 3.5.10). The entrance to this garden is marked by two kabōtarkhānas or dovecotes of approximately 16 x 16 feet (4.80 x 4.80 m). Pande and Kumari assert that Tipu made extensive use of pigeons for communication, and refer to a painting on the eastern wing of the Daria Daulat Palace substantiation of the claim. Hence, an elaborate lodging seems logical. The garden is set in a quadripartite style with the garden being divided into four parts by water channels which source water from river Kāvēri, and are bordered by cypress trees in perfect symmetry. This is approached by a series of wide granite steps on the northern side. 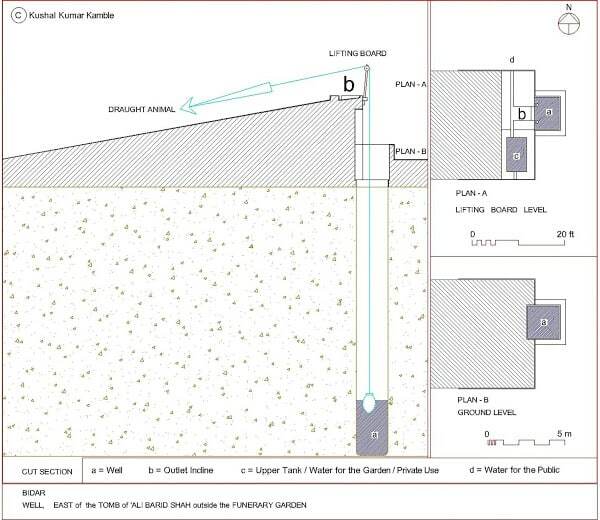 Noting that the planning is Indo-Islamic, Pande and Kumari argue that the connection made by the garden with the river bank is reminiscent of bathing ghats abutting temples. The garden here was also replete with many varieties of fruiting and flowering trees, the seeds of which Tipu procured from around the world. For an earlier reference, one might look to the gardens patronized by the Deccan Sultanate (fifteenth to seventeeth centuries). Historians Klaus Rötzer and Pushkar Sohoni consider two types of garden, the royal and the funerary, with respect to Bidar. Analyzing the royal garden below the Takht Mahal in the western part of the Bidar Fort built by the Bahmani Sultans in the mid-fifteenth century, they observe that this area is presently covered by vegetable gardens that are well-irrigated and a tank, called tālāb in Urdu. The garden, formed on two low lands and bordered by a dam, abuts the royal residence on its southern side. Rötzer and Sohoni assert that the lower level which is now cultivated housed another tālāb. A now ruined leisure space was lodged between the sluice and the dam (fig. 3.5.11). This garden was watered by two wells, two qanāts (horizontal wells formed by carving tunnels into the aquifers) and two baolis (step wells). Water was drawn up from wells and baolis by animals, a system adopted by Tipu later. 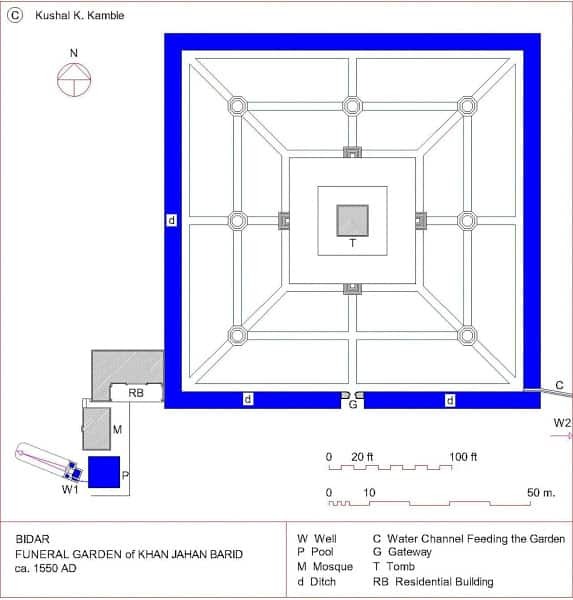 The second type, the funerary garden is explained by analyzing the Barīd Shāhi funerary complex (fig. 3.5.12). This consists of the royal cemetery consisting of tombs of the Bahmani dynasty. The layout, being geometrically precise, is aligned along the east-west axis. 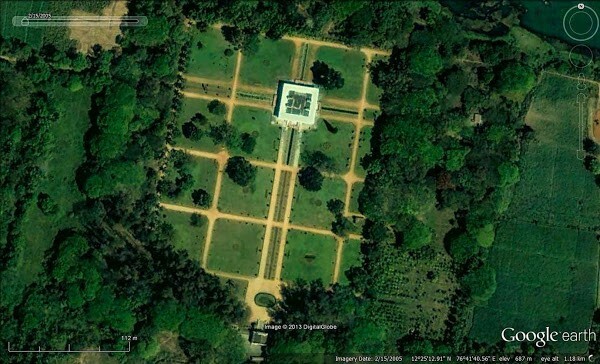 The royal cemetery is surrounded by baolis, irrigated land besides trees. A residential unit abutted the garden on the south-western side. The garden was irrigated by wells located outside its boundary. Rötzer and Sohoni explain the wells in Bidar gardens consisted of square or rectangular vertical shafts, a raised platform to lift water with the pulley fastened to wooden beams fixed in basalt stones, and a parapet of masonry for safety (fig. 3.5.13). The depth of the wells was usually about 20 metres (about 65 feet) and they were accessed by pegs set into holes carved at an angle for maintenance. Leather buckets attached by ropes, like the capily used in the garden of Tipu, were used to draw water; the ropes were pulled by bullocks going down on a ramp. Rötzer and Sohoni assert that many of these wells were situated deliberately outside the garden so as to be of use to both the owner (the royal) and the public. “They [the separate gardens designed by Hyder and Tipu in the same area] are extensive, and divided into square plots separated by walks, the sides of which are ornamented with fine cypress trees. The plots are filled with fruit-trees, and pot-herbs. The Mussulman [Muslim] fashion is to have a separate piece of ground allotted for each kind of plant. Thus one plot is filled with rose trees, another with pomegranates, and so forth. The walks are not gravelled, and cultivation of the whole is rather slovenly; but the people say, that formerly the gardens were well kept. Want of water is the principal defect of these gardens; for in this arid country everything, during the dry season, must be artificially watered. The garden of Tippoo [Tipu] is supplied from three wells, the water of which is raised by the capily, or leather-bag, fastened to a cord passing over a pulley, and wrought by a pair of bullocks, which descend an inclined plane [fig. 3.5.11]. This, the workmen say, is a much more effectual machine than the yātam. Buchanan adds that cypress and vine were grown in large number in the garden. Rice asserts that the Lāl Bāgh suffered some time during the later part of Tipu’s rule as the one of the darogas (officers) assigned with management failed to live up to the task. The darogas were father and son. While the father, Muhammad Ali, who had more powers than the son, maintained the garden well enough, the son, who succeeded him to the task, Abdul Khader, failed to do so and had limited authority. Drawing on Buchanan’s observation, one might conclude that in Bangalore, walks might have replaced water channels in a quadripartite manner of garden planning, particularly as these walk-ways were bordered by cypress trees like water channels in the garden of the Daria Daulat Palace. This makes sense in this scenario as there is an absence body of river or stream that can feed such water channels continuously. Present extensions and layout can be observed in figures 3.5.7 and 3.5.8. The walk-ways might have converged around a fountain as seen in later photographs from the early nineteenth century (fig. 3.5.2). This garden was later developed into a botanical showcase when Sir Mark Cubbon handed over the supervision to the then newly formed Agri-Horticultural Society, and another garden, the Cubbon Park, added to the north of the Pēṭē (in 1864 AD) as a buffer between the local settlement and cantonment, by the British. The garden was restored to the Goverment in 1842 AD and on the recommendation of Dr. Hugh Cleghorn transformed into a horticultural garden. Flower shows that were held from 1840 AD in a glass house conservatory, called the Albert Victor Exhibition Hall (fig. 3.5.5) twice a year in August and January have continued to this day (fig. 3.5.13). It is now popularly known as ‘The Glass House.’ Photographs from 1860 AD (fig. 3.5.2, fig. 3.5.6) and 1890 AD (fig. 3.5.3), contemporary with Rice’s work, are presented here. Both photographs depict the band-stand in the background; however, in fig. 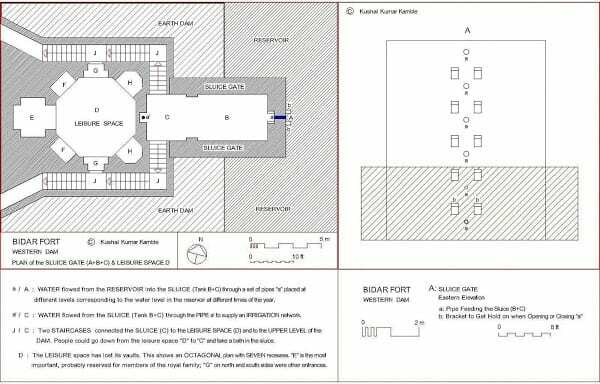 3.5.3, we can observe the reflection of the changes in patronage as the water-bodies (fountains) which are an integral feature of Mughal gardens seen in fig. 3.5.2 are replaced by bushes and small lawns. Fig 3.5.4, though labelled similarly, does not bear resemblance to the present structure. The garden is also home to one of the boundary towers built by Kempē Gowḍa II, considerably altered now; this is set on a rocky hillock near the east-entrance (fig. 3.5.14, fig. 3.5.15). Note: This has been published with the author’s permission.